If you've ever had breakfast (or lunch or dinner) at the Streamliner Diner on Bainbridge Island, you may be familiar with these four authors. 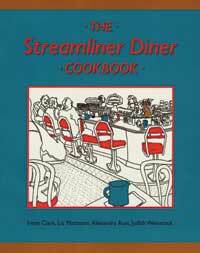 And if you are not familiar with them, you have probably eaten some of the delicious dishes featured in their The Streamliner Diner Cookbook (1990). The book is a collection of favorite recipes from the downtown Winslow eatery, ranging from muffins and cakes to soups and main dishes. All of the recipes use readily available ingredients and the instructions - interspersed with diner-inspired drawings by Irene Clark - are easy to follow. As a result, the cookbook is useful even for a culinary neophyte. And if one doesn’t feel up to the task of cooking, one can always stop by the place. Even though Clark, Matteson, Rust, and Weinstock have sold the business years ago, the food is still great.